Washington: A top North Korean official’s visit to Washington is the strongest sign yet that President Donald Trump and Kim Jong-un are on the verge of announcing a second summit. This time, Kim’s likely to raise his price. In speeches, state media commentaries and meetings with his Chinese and South Korean counterparts, the once-reclusive North Korean leader has laid out a remarkably transparent list of demands to break the deadlock in nuclear talks. His agenda ranges from restarting economic projects frozen by sanctions to formally ending the 1950-53 Korean War to weakening the US-South Korean military alliance. The question for Trump as he prepares to host top Kim aide, Kim Yong-chol, on Friday, is what he’s willing to give up — and can he get enough to justify the cost? 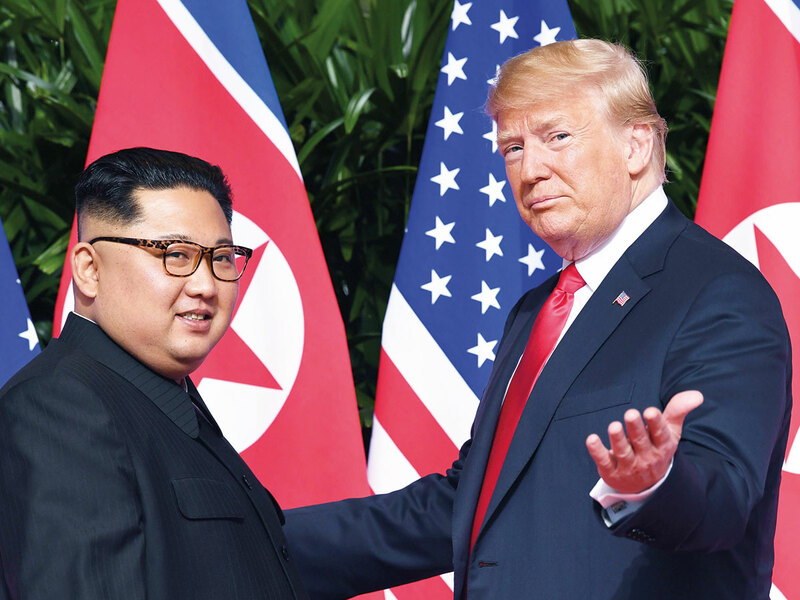 In the seven months since Trump and Kim Jong-un agreed to “work toward complete denuclearisation of the Korean Peninsula,” his regime has made no commitments to let North Korea’s arsenal be inspected or dismantled. Since Trump withdrew his war threats and launched talks with Kim Jong-un last year, the US-backed sanctions against North Korea’s economy remain his strongest bargaining chip. Kim has made clear his expects to get at least some penalties lifted, denouncing them as “vicious” and threatening in his New Year’s address to take a “new path,” if the US doesn’t ease off. Until now, Trump administration officials have insisted that all the penalties remain until Kim agrees to “the final, fully verified denuclearisation of North Korea.” Kim Yong-chol, who arrived in Washington on Thursday, will be looking to firm up recent clues that the US position is softening. Vice President Mike Pence told NBC News that the US would seek a “verifiable plan” to declare North Korea’s nuclear sites and weapons stockpiles as the result of a second summit, not before it, as officials had earlier insisted. And South Korean Foreign Minister Kang Kyung-wha said on Wednesday that the country was discussing “corresponding measures” with the US to reward North Korea’s steps toward denuclearisation. Kim Jong-un’s New Year’s address, in which he cited joint railway, tourism and manufacturing projects with South Korea, may offer clues into what those measures could entail. Getting those projects moving will require exemptions or repeal of US, South Korean and United Nations sanctions. He also made an unusually frank acknowledgement about his country’s power shortages, which could be aided by relaxing UN fuel embargoes. The US’s envoy to North Korea talks, Stephen Biegun, said in December that the administration was considering looser restrictions on getting humanitarian aid and workers into the country. Biegun told a meeting with US non-governmental organisations last week that they should resume applications for permission to visit, said Keith Luse, the executive director of the National Committee on North Korea. Seven months since shaking hands with Trump in Singapore, Kim has shown little interest in giving up the nuclear arsenal that his regime views as essential to ward off a US attack. In fact, independent analysis shows the country’s weapons production likely expanded last year, probably adding several intercontinental ballistic missiles and enough fissile material for about six more nuclear bombs. He’s also resisted US demands for a detailed list of his nuclear assets, with state media last month comparing it to handing over a target list. Still, Kim has repeatedly shown a willingness to dismantle facilities used for provocative weapons tests, which experts say he no longer needs. Similarly, North Korea might be willing to dispense with its plutonium-producing Yongbyon nuclear plant, something he offered in exchange for US concessions during a meeting with South Korean President Moon Jae-in in September. While Kim has since moved on to uranium-fuelled bombs, the move could help jump start the denuclearisation process. In the long run, non-proliferation analysts say Kim’s strategy appears to be quietly fortifying his arsenal while creating the diplomatic climate necessary for North Korea to be tolerated as a nuclear state, such as India or Israel. From the moment Kim offered talks to participate in South Korea’s Winter Olympics last year, he has put increasing pressure on the country’s 70-year-old alliance with the US Trump has provided him an unusually receptive audience in the White House, exemplified by his unilateral decision to suspend major US-South Korea military training exercises after their summit in June. Even North Korea’s desire for a declaration formally ending the Korean War — a concession the US has so far withheld — could support that goal. Replacing the 1953 ceasefire with a peace treaty would remove a rationale for having some 28,500 troops stationed on the peninsula, even if Kim’s nuclear weapons and China’s rising military remain.